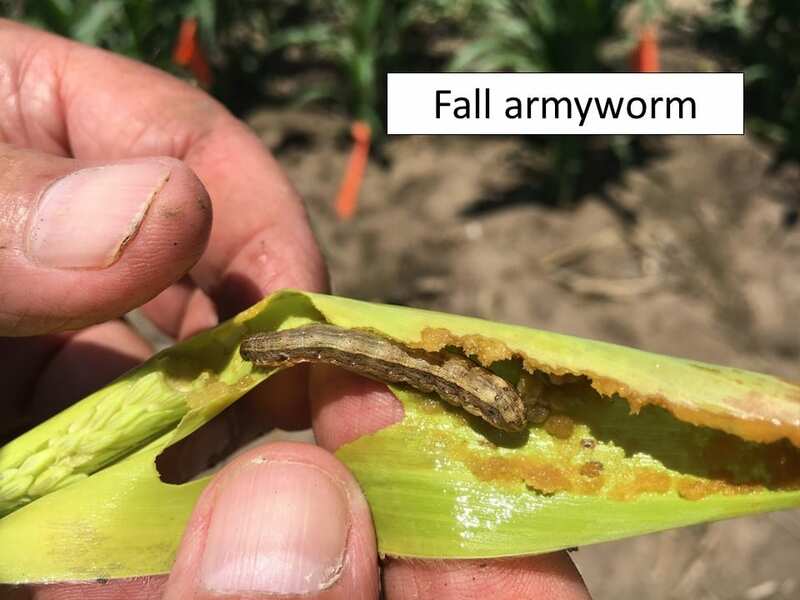 One relatively mature fall armyworm larva was also detected. 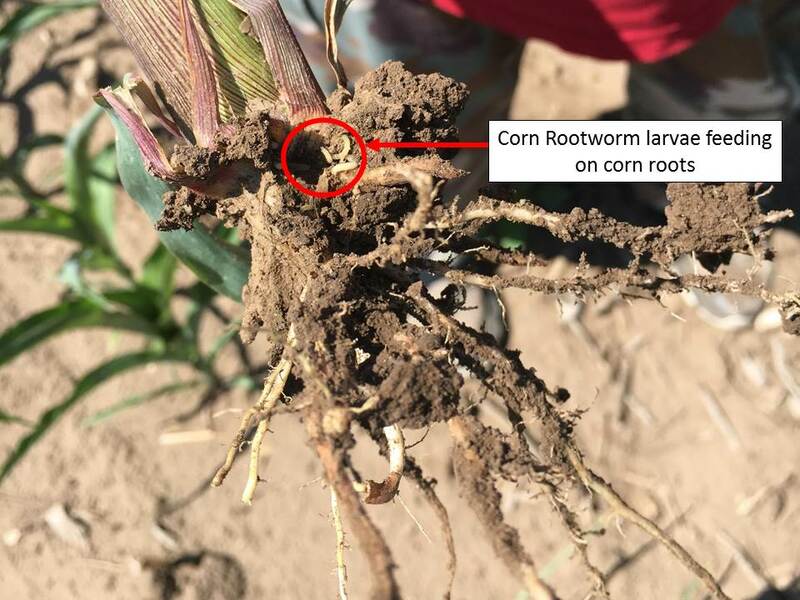 Thus, in approximately 2-3 weeks there will be a new generation of fall armyworm larva ready to start feeding, most likely, on sorghum. 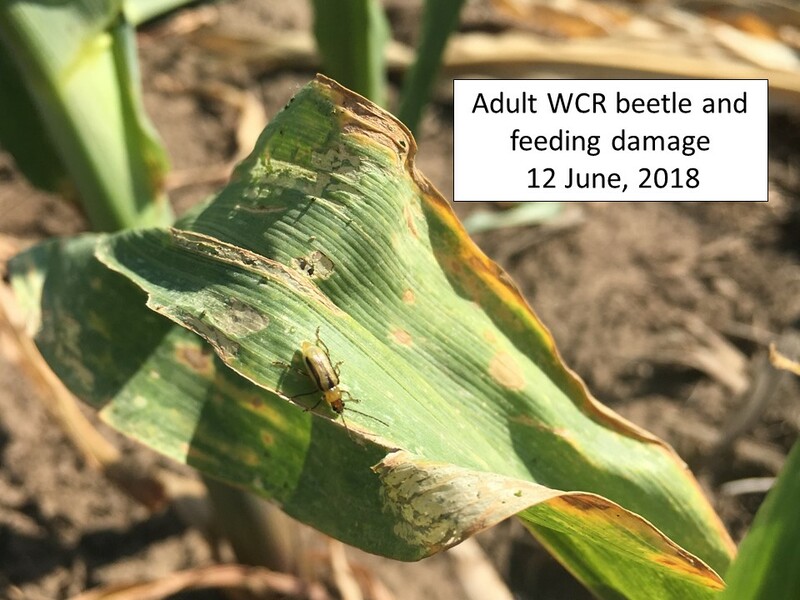 Adults of both green June beetles and Japanese beetles seem to be ramping up their activity throughout eastern Kansas. These two relatively large, conspicuous beetles are being confused. Green June beetles, at 1 inch long, are considerably larger than Japanese beetles. Also, green June beetles are green to copperish green in color and more pointed toward the anterior (head) end. 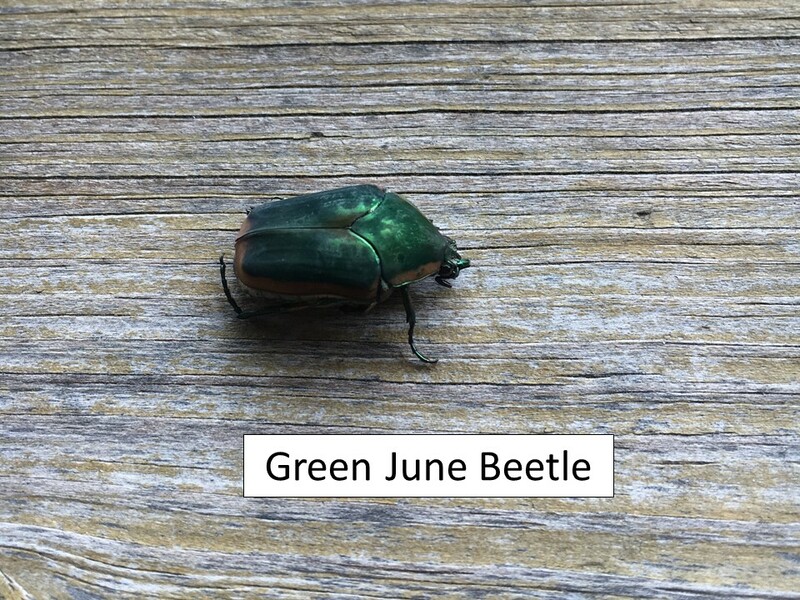 Japanese beetles are probably only 1/3 to ½ as big as the green June beetle. They also have small, but highly visible, little white tufts of hair on both sides of the abdomen sticking out from under the elytra. 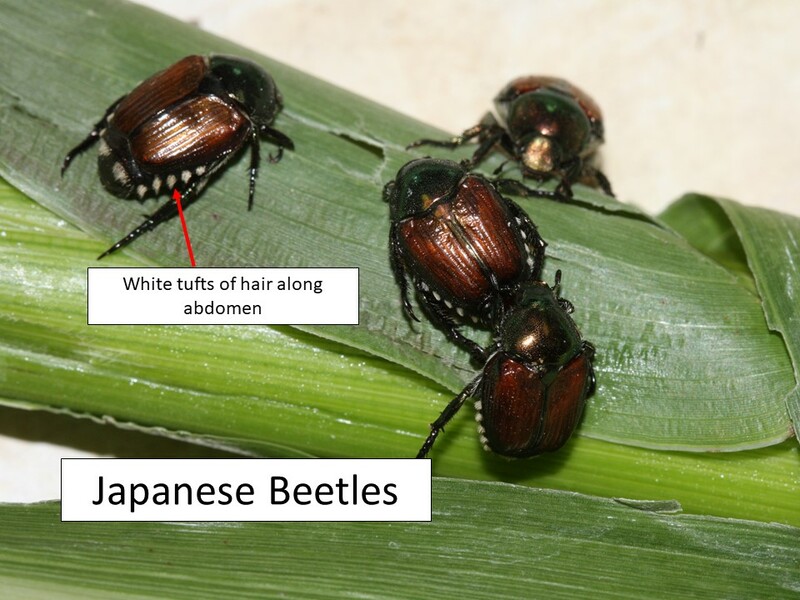 Japanese beetles may be found feeding on silks in corn fields and/or pollen or leaves in soybeans while green June beetles are more confined to feeding on nectar from flowering bushes or trees close to where the larval stage, i.e. grubs, were developing in the soil. 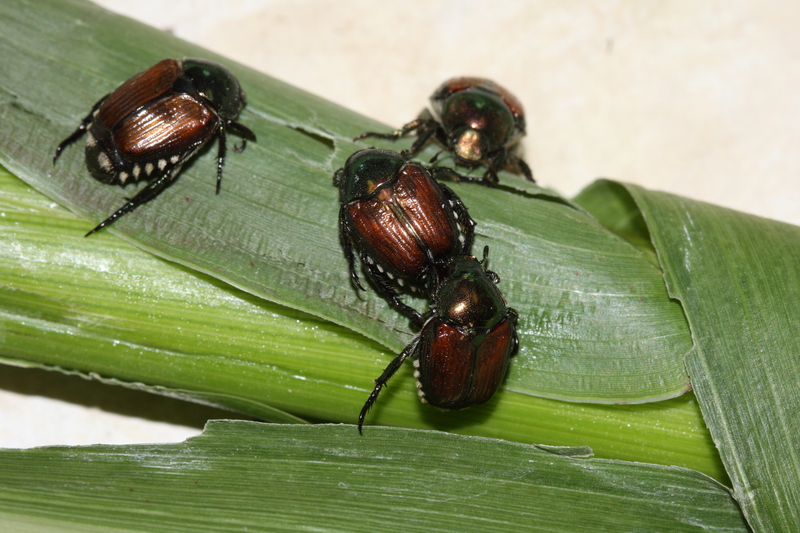 Green June beetles are not an agricultural concern while Japanese beetles occasionally can be. 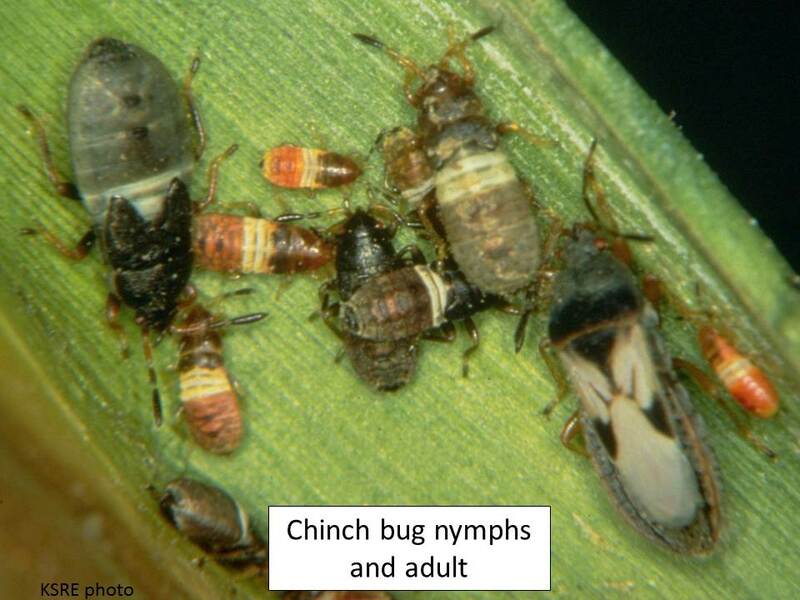 All life stages of chinch bugs seem to be extremely active at the present time in both corn and sorghum. 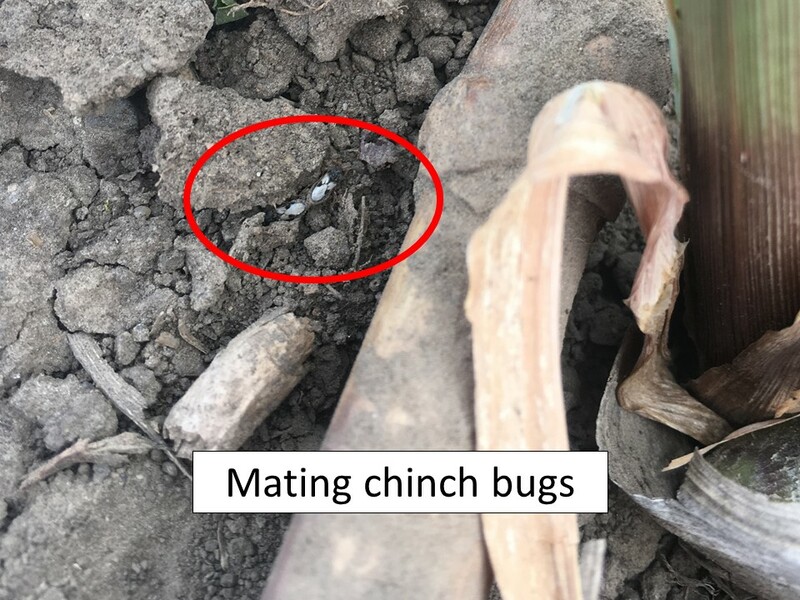 Nymphs and adults started migrating out of wheat fields at least two weeks ago, moving into any adjacent corn or sorghum fields. Those smaller reddish nymphs have grown considerably since then, and are now either late instar nymphs or adults. 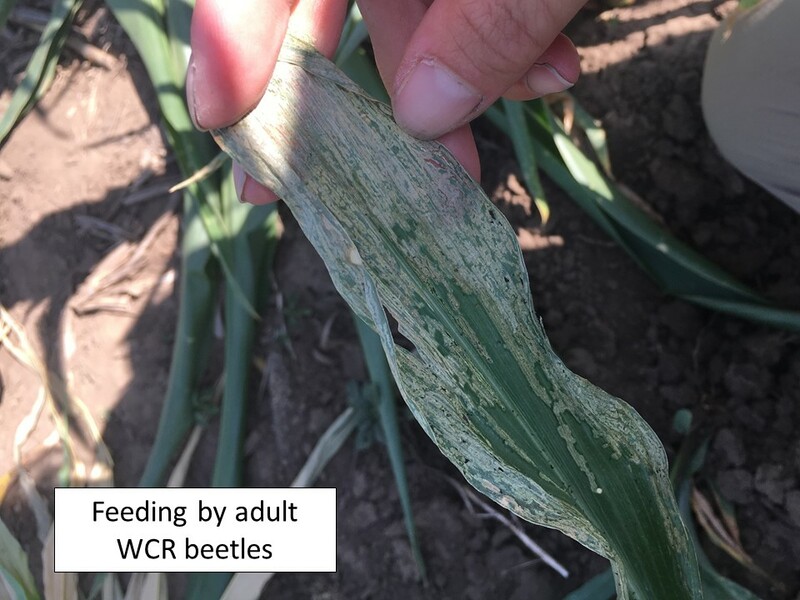 The first western corn rootworm (WCR) adults were observed on 12 June from north central Kansas. There are still larvae feeding on roots but most are/have pupated and adults are emerging from soil. 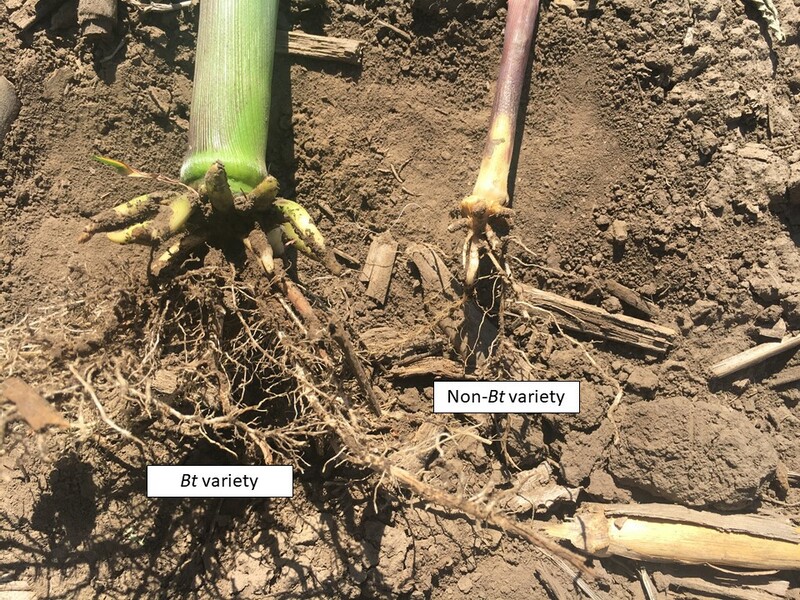 None of the corn sampled in north central Kanas has tasseled or started silking yet. Thus, these adult WCRs are feeding on leaf tissue in the early morning or early evening and resting in shady places during the hottest part of the day. 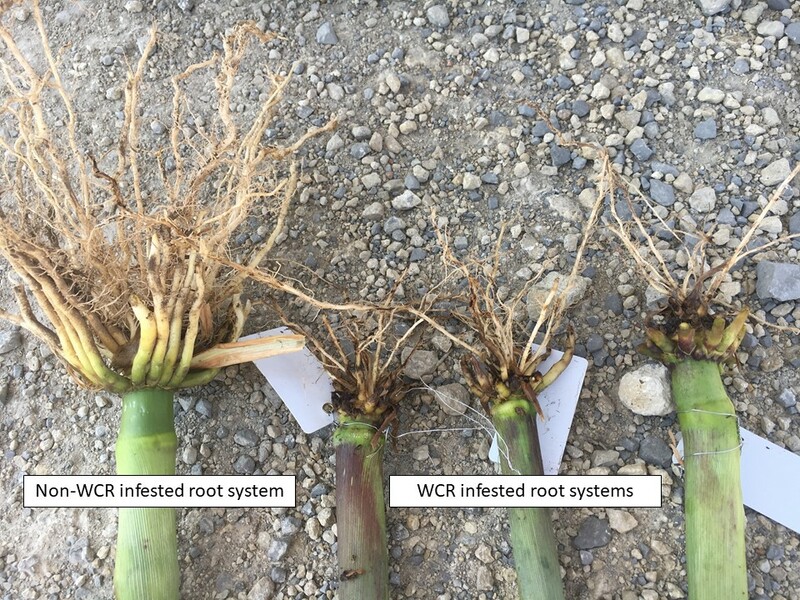 A great example of WCR larval root pruning is seen in this picture compared to a non-infested root system. As the wheat senesces, it continues to be less and less succulent. Thus, chinch bugs have been, and will continue to, migrate to find a suitable food source. They will utilize any actively growing grasses in the vicinity. The small nymphs cannot fly and thus must crawl to the nearest food source. They are pretty fragile and therefore can’t go very far without finding a food source before they perish. 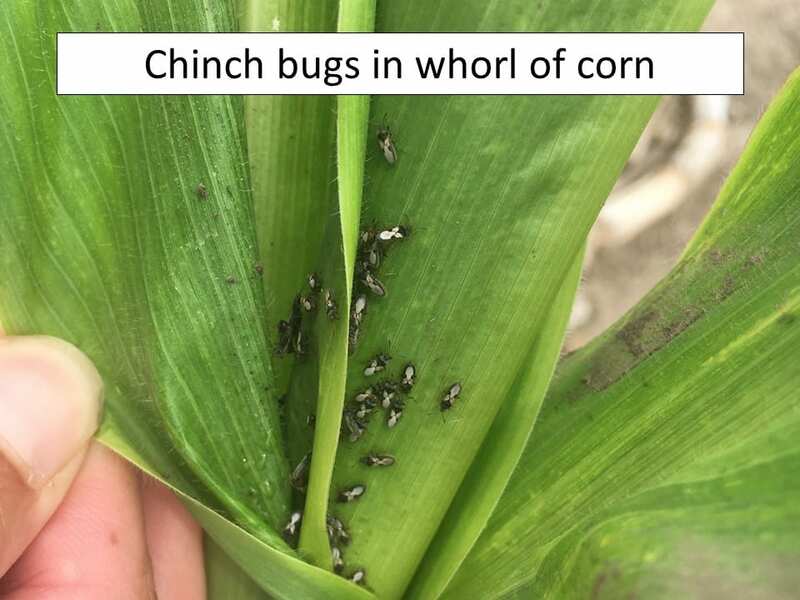 Have received several inquiries relative to corn earworms in field corn and there does seem to be a good infestation of them throughout north central Kansas. 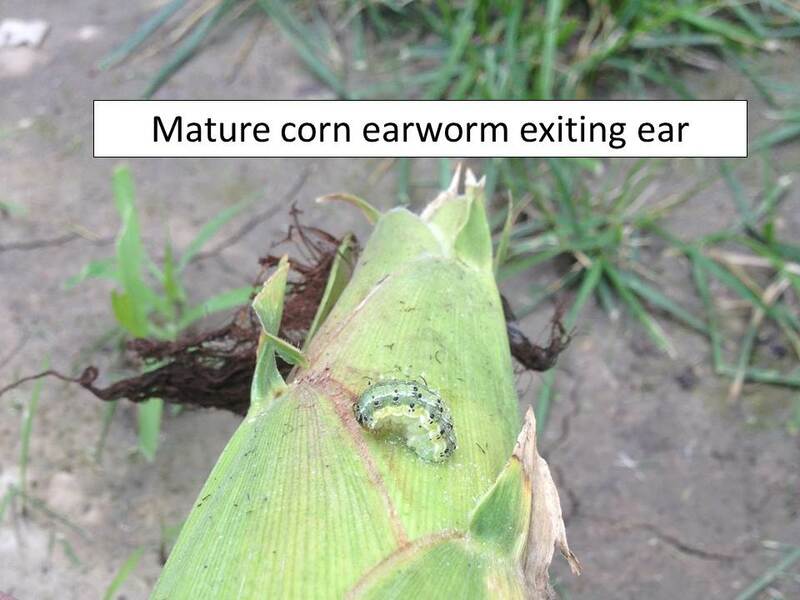 100% of the ears we have randomly checked currently are, or have recently been, infested with corn earworm larvae. Many of these larvae are still relatively small and thus will be feeding for another week or two. 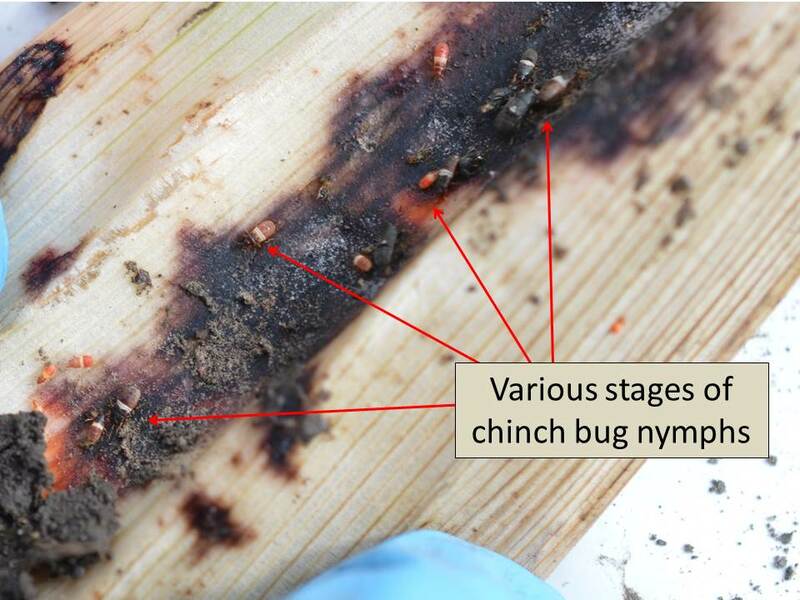 The two most common questions received this week relative to these pests are; 1) Will a rescue treatment work? The answer – no. 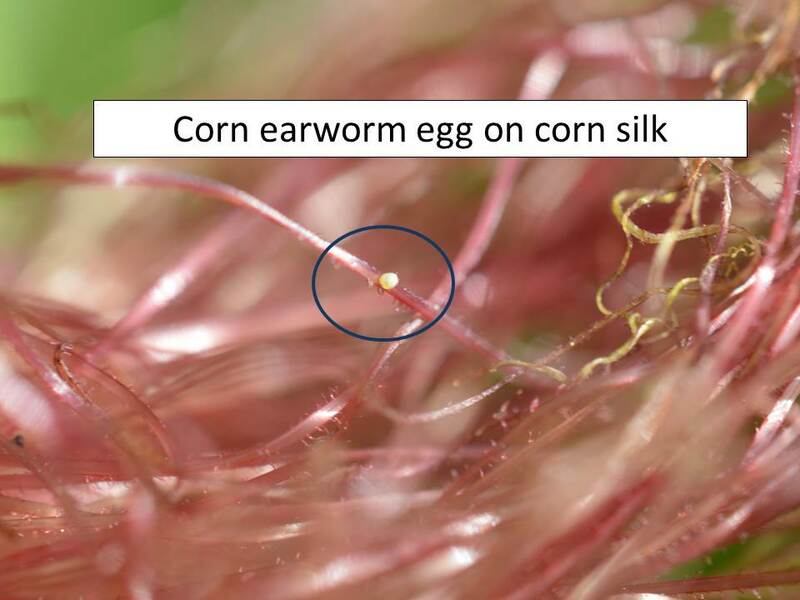 Once the larvae have hatched from eggs deposited on the silks and moved into the husk, they will be protected from contact insecticides. 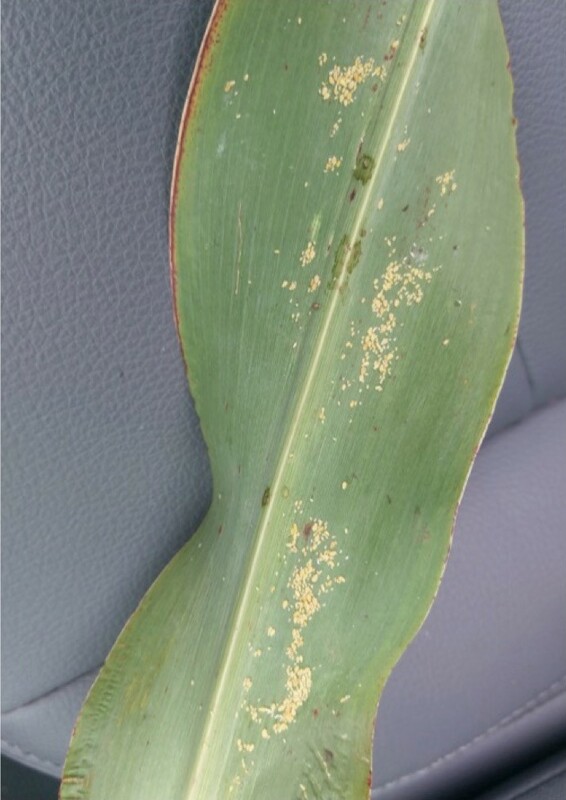 2) Will they re-infest these corn ears? The answer – no. 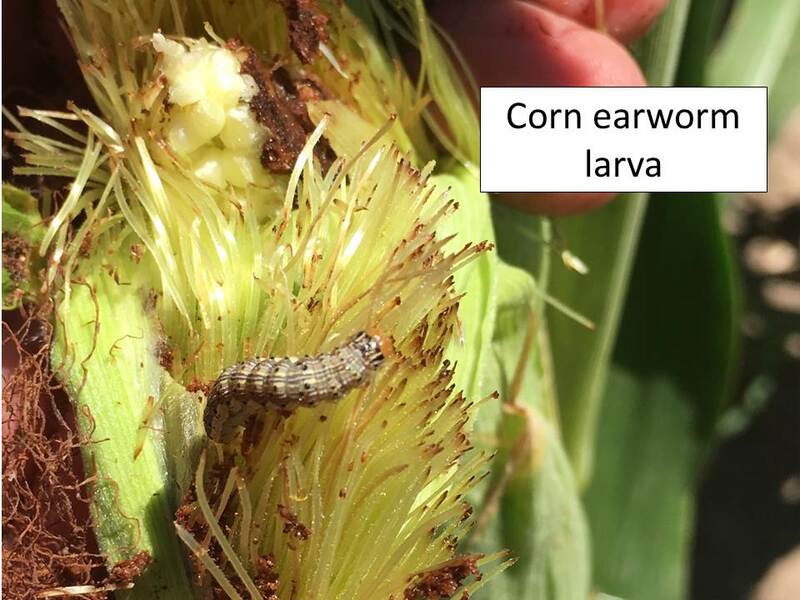 Field corn will be too tough by the time these larvae finish feeding, pupate in the soil, emerge as adults, mate, oviposit, hatch, and larvae initiate feeding. 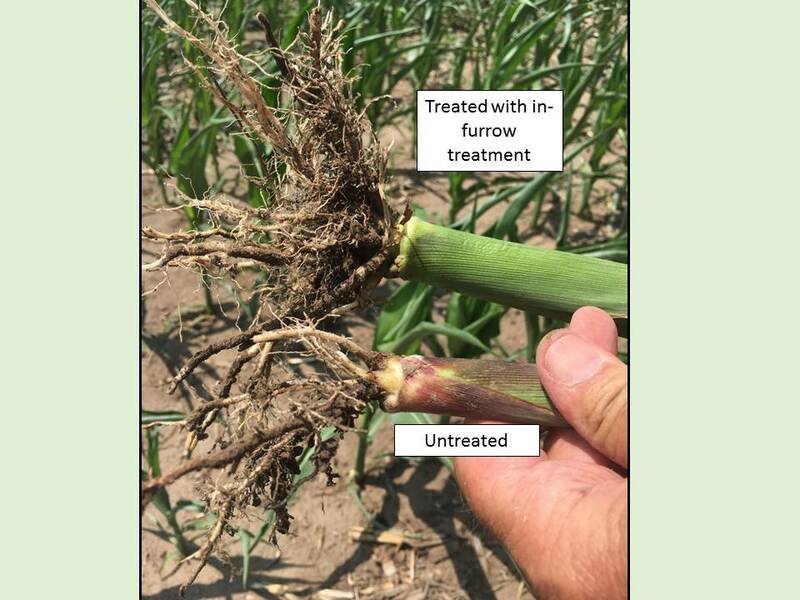 But, the adults of this generation will move to soybeans (soybean podworms) and/or sorghum (sorghum headworms) to oviposit and larvae can do considerable damage by feeding on soybeans within the pods and/or directly on the kernels of the heads of sorghum plants. 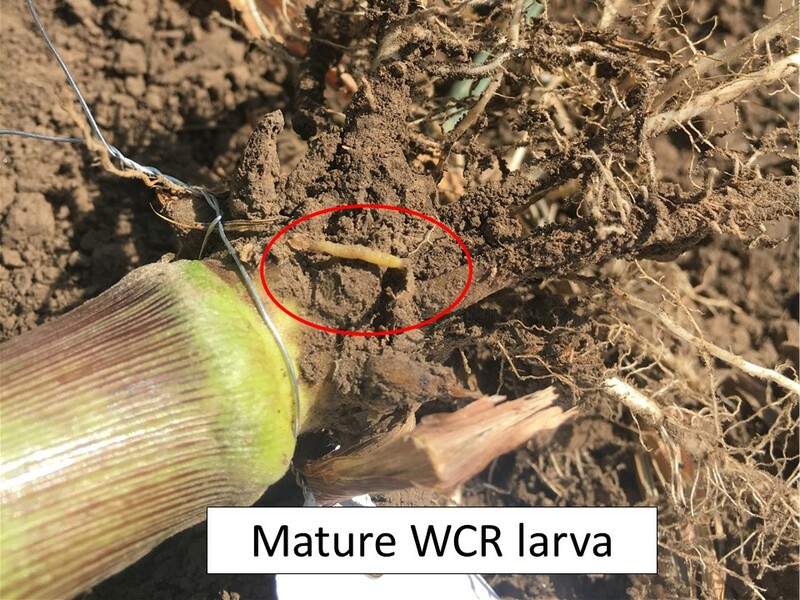 So, the larvae currently in corn are the “spring board” for the next generations moving into soybeans and sorghum.